Friday July 17, 1942 U. S. NAVAL AIR STATION MIAMI, FLORIDA Dear Family, Enclosed is a picture which appeared in the Miami Daily News the other day. The term "one man gang" both pleased and amused me. It is the supreme superlative of a rough, tough, top-notch football player. It implies the man whose reputation strikes dread into the hearts of the opposition, the man whom no one wants to tackle, who bruises you all over every time he hits, and who never tires. Yes, I liked the appellation, but at the same time it made me laugh, as it will you folks, for I am quite certain that none of the opposition thought of me in such a way. Rather each and all probably looked forward to tackling me, snowing me under, giving me the works. The only fear of my prowess that they may have suffered would have been the passes. Skillful passing may bring bewilderment, irritation, defeat to the opposition, but it doesn't bruise them, nor rock their eye teeth. Defeat thru the air is hard for the vanquished to accept in good grace. They view it as a combination of fraud and luck. This is all passing comment, no regret nor irony on my part. However, I can't help feeling that if I had possessed the speed of Green, or even Buzz Dean, I might have well earned the designation "one man gang." I also am sending along the lengthy comment on Wallace's speech authored by Harry Beardsley and a letter I received from him today. As I have previously indicated to you his remarks expressed quite clearly my feelings on the matter. Believing him to be the same man who covered some of our games in the fall of '39 I took the liberty of writing him a brief note of approbation. This was quite awhile ago, and I had decided that I would never hear from him. 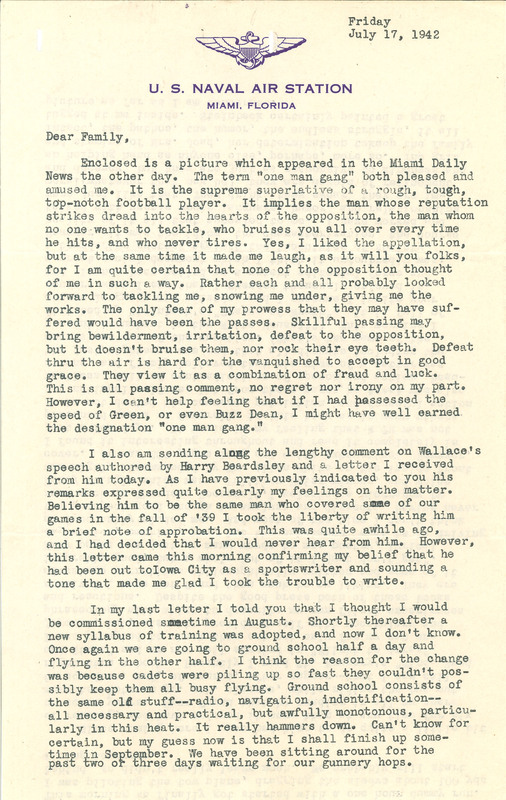 However, this letter came this morning confirming my belief that he had been out tolowa City as a sportswriter and sounding a tone that made me glad I took the trouble to write. In my last letter I told you that I thought I would be commissioned sometime in August. Shortly thereafter a new syllabus of training was adopted, and now I don't know. Once again we are going to ground school half a day and flying in the other half. I think the reason for the change was because cadets were piling up so fast they couldn't possibly keep them all busy flying. Ground school consists of the same old stuff--radio, navigation, indentification-- all necessary and practical, but awfully monotonous, particularly in this heat. It really hammers down. Can't know for certain, but my guess now is that I shall finish up sometime in September. We have been sitting around for the past two or three days waiting for our gunnery hops.